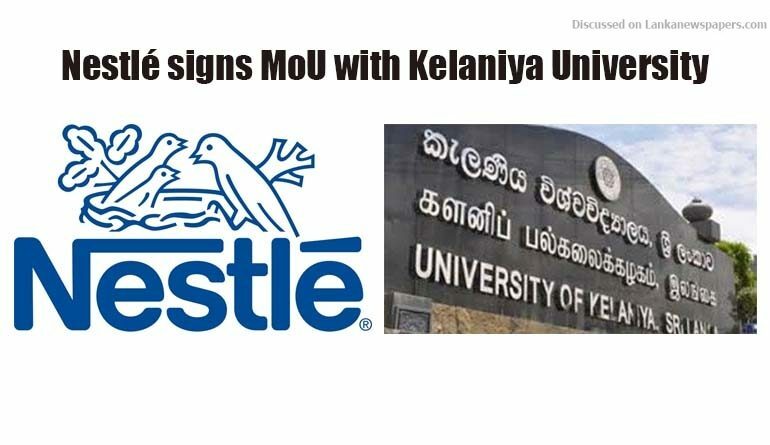 Nestlé has signed an MoU with the University of Kelaniya’s Department of Marketing Management. The Company has come on board as strategic partner for the University’s ‘Certified Professional Marketing Graduate (CPMG)’ programme, which offers high performing students an additional professional qualification in marketing on top of their degree. The agreement is part of Nestlé’s new initiative to support youth employment in Sri Lanka, called ‘Nestlé Needs Youth’, by providing young people with skills and training to enhance their employability, a press release stated. As part of CPMG, the top 30 students following the University’s ‘Diploma in People Skills’ were taught and trained by Nestlé employees on 15 subjects covering Collaboration, Leadership, Innovation and Personal Development. The sessions were held at Nestlé’s Training Centre in its head office, where in-house facilitators shared theoretical and practical applications using various training interventions. Students also participated in field visits across three regions for an in-depth insight and real experience of the market. The first batch of the ‘Diploma in People Skills’ recently graduated, receiving their certification from Nestlé and the University of Kelaniya. The top 10 students will be awarded sales training stints with the company for six months. Nestlé also provides young people with employment; today, 35% of Nestlé’s workforce are under 30-years and 60% of its total workforce are millennials. The Company is also actively engaging in readiness-for-work activities for youth – through digital media and events such as job fairs and workshops – on CV writing and interview preparation. Nestlé MD, Shivani Hegde said, “Part of our purpose as a company is to help develop thriving resilient communities. Nestlé is committed to promoting decent employment and diversity, and ensuring equal opportunities for everyone. Young men and women are the future of our societies and our economies. Yet traditional education is often no longer enough. Young people need the right skills to help them in a rapidly changing, digitalised work environment. It will be hard to thrive as a corporation and help the communities we are part of to grow unless we can tap into the skills of young people who will drive the next wave of development. This long-term approach has always been part of Nestlé’s DNA.”Visit www.nestle.lk for more information, the release concluded.